Ocracoke to hold championship baseball game on Thursday, June 7th at 4pm. The Little League season with our friends in Buxton has come to a close for the Ocracoke teams. This can’t stop us! On Thursday, June 7 at 4:00 pm, the Orioles and the Marlins will be mixing up their players for the first ever Intra-Island Little League Championship of the World!!! The rules might seem a little funky, but they will be designed to be fair for the younger kids and fun for all. The tireless Bob Toth will be working the grill and many of the Ocracoke Dolphins’ school baseball players will be helping out with the game. 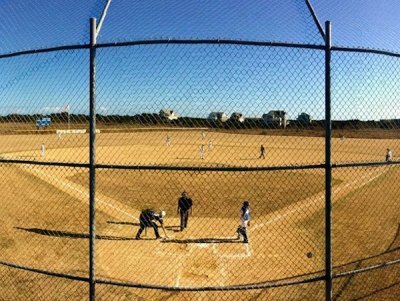 Please come out to the Ocracoke Community Park, the most beautiful field in North Carolina, to see a game played by those who play it the best – kids having fun! The Ocracoke Marlins youth baseball team (age 7-9) is playing awesome baseball in the Babe Ruth League. The Marlins have been having so much fun playing baseball and improving our skills that we really don’t pay attention to the score-board until the umpire tells us that the game is over. The Marlins dropped two games in a fierce double-header against Hatteras’ nefarious Dodgers at Ocracoke’s field on May 5th. In this contest, Marlins’ game balls were awarded to Mau Perez and Brayden Swain for their leadership on the field and their performance at the plate. Mau leads the Marlins at first base and Brayden has learned the challenging position of catcher and hits with power to all fields. We were rained out on 5/8, and went to Buxton on 5/12 to give our best game to the always-challenging Mariners. Both teams played an incredible game with great fielding and hitting by both the Mariners and Marlins. Marlins’ Petros Burleson hit a 3-run home run in the second inning to keep Ocracoke in the game and our fielders played their best game ever! Malli Harrell and Charles Hodson got their first base hits in this game and Malli scored a critical run. The game ball in this game went to Duncan McClain who hit 2 for 2, scored two runs and made an amazing play at second base for an inning-closing put out from short-stop Eli Schweninger. Coach Jim said, “I’m so proud of the Marlins, they are learning so much about baseball and playing together as a team, it is incredible to be a part of this.” He also thanks his assistant coaches and most importantly, the ballplayers from the Ocracoke Dolphins Middle-School baseball team who have been coming out to help with practices and pre-game warm-ups. Baseball is fun – Go Marlins!!! 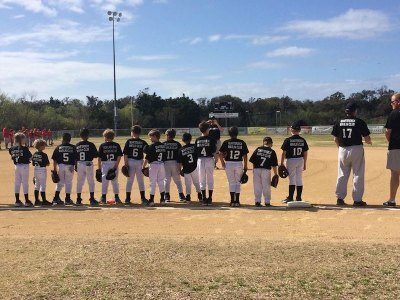 The Orioles (age 10-12) played a doubleheader against the Braves of the Hatteras Island Youth Baseball League on May 5th at their home field at Ocracoke Community Park. They played good team ball in the opener and the bats were hot as starting pitcher Jacob Daniels got plenty of run support. Uriel Guerrero took to the mound for the first time and looked strong in closing out the game for a 14-0 victory. Uriel also started the second game of the night as the Orioles bats continued to pound out the hits. Finn Kattenberg came in to close out the game as the home team swept the visitors 8 to 3. The Orioles were away at the Buxton field and took on the Reds on May 12th in a very tight game. The teams fought to a tie at four a piece when the dust settled in a six inning affair.